You are currently browsing the The Pet Product Guru blog archives for the day Thursday, March 15th, 2018. 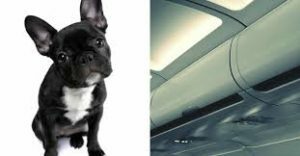 I’m sitting here writing this today still very sickened and saddened after the death of an innocent dog that was stuffed into an overhead compartment on a United Airlines Flight. You can read this very disturbing story in a CBS article below. Before we do that, let me point out that of the last 24 pets that died on an airplane, 18 we on United. There is a real underlying problem with United Airlines. The care of passengers and pets are neglected in preference to money, money money! A grieving family is speaking out after, they say, a United Airlines flight attendant forced them to put their dog in an overhead bin, where he died in flight. The 10-month-old French bulldog was kept there for the entire three-and-a-half hour trip Monday from Houston to New York. The family heard him barking in the overhead compartment for two hours. The airline has apologized. United Airlines issued a statement accepting full responsibility for the incident, which it says is under investigation. Still, many are wondering how an experienced flight attendant could let this happen, reports CBS News transportation correspondent Kris Van Cleave. “He was a really special dog. It’s just sad the way he has to, just leave,” said 11-year-old Sophia Ceballos. For Sophia and her mother, Catalina Robledo, Kokito was part of the family. Robledo put the dog in a carrier but struggled to put Kokito’s carrier under the seat in front of her. The family says a flight attendant insisted it go in the overhead bin. “‘It’s a dog, it’s a dog.’ He can’t breathe up there.’ And she said, ‘It doesn’t matter, it still goes up there … She felt the dog and she put him up there,” Sophia recalled. The family says they heard Kokito barking for two hours, then he stopped. They wanted to check on him but couldn’t. “We tried, but there was a lot of turbulence. And we weren’t allowed to stand up,” Sophia said. “My mom was crying, she was just screaming, she was looking at him,” Sophia said. Retired airline captain Denny Kelly says the pitch-black overhead bin is dangerous for any live animal. The American Kennel Club says a French bulldog’s short face can make its breathing less efficient, and the animals stress easily, increasing their need to breathe. Kokito’s owners hope others learn from this death. The family says the flight attendant claimed afterward that she didn’t know there was a dog inside the bag. She’s been described as distraught. We have spoken to the family, our crew and a number of passengers who were seated nearby. We have learned that the customer did tell the flight attendant that there was a dog in the carrier. However, our flight attendant did not hear or understand her, and did not knowingly place the dog in the overhead bin. As we stated, we take full responsibility and are deeply sorry for this tragic accident. We remain in contact with the family to express our condolences and offer support. To prevent this from happening again, by April we will issue bright colored bag tags to customers traveling with in-cabin pets. This visual tag will further help our flight attendants identify pets in-cabin. Cheer yourself up today with the greatest oldies of your life! Forget about all of the disturbing things that are happening in our world today- Let the music take you away! Edgewater Gold Radio! Download the Edgewater Gold Radio app today and listen to Edgewater Gold Radio on our website: edgewatergoldradio.com. add comment Comments Off on Please Boycott United Airlines!